Trim excess fat from beef. Cut beef into 4 pieces. 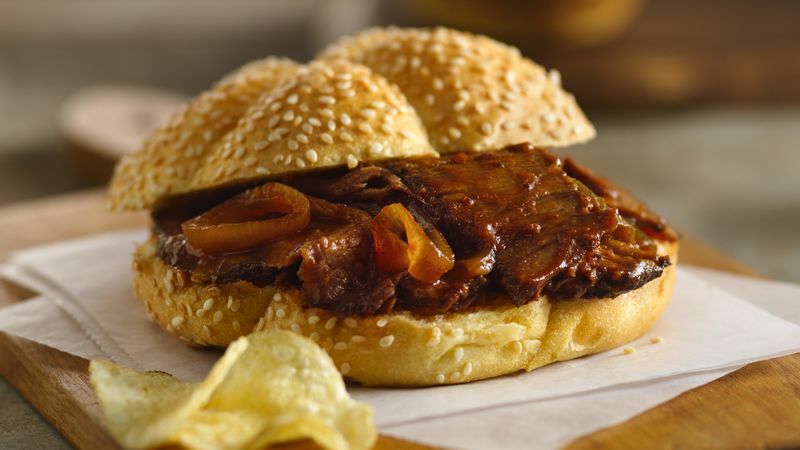 Place beef in 4- to 5-quart slow cooker. Mix remaining ingredients except buns; pour over beef. Cover and cook on low heat setting 7 to 8 hours or until beef is tender. Remove beef to cutting board. Cut into thin slices; return to cooker. Cover and cook on low heat setting 20 to 30 minutes longer or until beef is hot. Fill buns with beef mixture. Note: This recipe was tested in slow cookers with heating elements in the side and bottom of the cooker, not in cookers that stand only on a heated base. For slow cookers with just a heated base, follow the manufacturer’s directions for layering ingredients and choosing a temperature. For a delicious kick, spread buns with horseradish sauce. Take a dip! Sandwiches can be served au jus. Serve the juices left in the cooker in small bowls to dip the sandwiches into while eating to make each bite extra delicious!